As soon as you enter our farmstand you can smell the aroma of freshly baked donuts and pies. 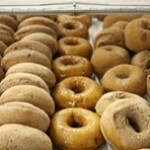 We make fresh Apple Cider and Pumpkin Donuts everyday here at the farm. Our handmade pies are baked fresh everyday with top quality fruit and wholesome ingredients. No canned pie filling here. Our pies are available in large and small sizes. Small (6 inch) personal size serves 1-2 pieces/people, or just enough to pile ice cream or whipped cream on and eat yourself. The following varieties of pies are baked here daily. Home-baked Pies-Apple, Blueberry, Cherry, Dutch Apple, Very Berry, Peach, Pumpkin, Pecan and High Topped Apple. Please call ahead to be assured that your pie flavor will be available. Our pies can also be purchased frozen for you to bake later. We provide baking instructions so that your pie will be cooked to perfection. Many of our customers will purchase several pies to “hold them over” between our seasons.